The kite has a 40cm (15 3/4") tall sail. In flight, the Paper Diamond flies steadily at low wind speeds then begins to swish from side to side in stronger breezes. Due to it's small size, this kite has a rather light pull on the flying line. Hence it may be flown by small children. As an adult, you will be amazed at how high this little kite will go on polyester sewing thread! If you leave your winder attached to the kite, setup time out in the field is zero! No wasted time. Ready to see this little kite do it's thing? The movie clip further down was taken down at a local beach, in almost perfect weather for it. The sea breeze was coming in at an angle off the ocean. Sunlight poured down from an almost cloudless sky. Initially the breeze was ample and the kite swished about on a very short line as I took some photos. Turbulence from my body as I stood there was probably affecting the flight as well. Despite this being a 'sticked' design, there no sticks to find or buy! Instead, you are shown a neat trick on how to make stiff and light spars from just paper and tape. The kite takes up very little space in your home. Just stow it on a shelf or on top of a cupboard, with the winder underneath the kite. You can make your own winder too, from just copier paper and sticky tape. 400 feet of ordinary polyester sewing thread can be wound on. This kite will easily fly to 300 feet above the ground on that length of line, in ideal conditions. Paper. Tape. Thread. That's the complete materials list for this high-flying sparred kite and it's winder with line. Talk about convenient :-) You've probably got all that lying around the house somewhere! 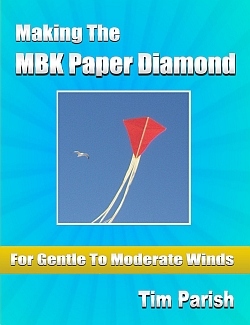 "Making The MBK Paper Diamond"
Knowing how to make a paper diamond kite is just a few minutes away now. You could have it in the air before the sun goes down. OK, maybe by lunch time tomorrow :-) You'll find it's a really fun little kite. To make and to fly.